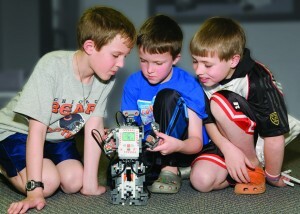 Bits, Bytes & Bots offers a variety of classes including robotics, stop-motion animated movie making and game creation. Our curriculum is always on the cutting edge of the technology and our robotics program utilizes the Lego® Mindstorm® NXT robots. People ask us what the difference is between our programs and other technology programs available and we proudly tell them that WE TEACH! Our teachers are background checked for your children’s safety and are thoroughly trained educators, parents, and technology buffs who share our vision of ensuring your children get the highest quality technology education available.